Posted on 01/25/2013 by Stand and face the sun. Happiness is a part of you. It’s always there, you’ve just forgotten where to look. It’s a lot like a cat’s tail. It’s always there, yet one day, they turn around and are surprised to see this “thing” moving. So they start swatting at their own tail. Dog’s do it too, running in circles chasing their tail. Not realizing that their tail is a part of them. Then when they finally do catch their tail they don’t seem to know what to do with it, like the way people don’t seem to know what to do with happiness when they find it. Some people have been telling themselves the same depressing story of their life for so long they don’t know how to live and embrace anything other than what they have convinced themselves of. They’ve caught their own tail and now don’t know what to to do with it. This can be a similar problem to the way some people believe the 8 limbs of yoga work. Or better yet the way karma works. Karma and the 8 limbs of yoga are not linear. It’s not if I do this…I will get that. We live in a culture strongly based on immediate gratification. Life can be like that stick at the amusement park that tells you when you are tall enough to ride the ride. We have to experience growth first, before we can have some of the things we want in life. No amount of standing on our tip toes will solve the problem. It’s just not time, we are not ready yet. Understand that if you rode that ride now your life would be in danger. Somethings we are just not ready for. Are you really ready to be happy? I once experienced very linear karma but in most cases it’s more of an accumulative thing. This lady was riding my bumper at 6:00 in the morning down a two lane road. She decided to pass me crossing the double yellow line and was immediately pulled over by the cop that was behind her. She was so focused on where she needed to be, that she forgot to focus on where she actually was. But in most cases doing the right thing, the good thing, won’t pay off in some immediate result. But there will come a day where those right actions will leave you right where you are supposed to be . If we are always focussed on where we are going instead of where we are, we miss the joyful moment that is unfolding right in front of us. What makes you think you are not happy right now? Is it that someone else’s happiness looks different than yours? Is it that happiness didn’t show up on your timeline? Is it that happiness didn’t have enough bells and whistles for you? Is it that no one is there to witness it? A lot of the time we are happy, we just won’t admit to it because there is no audience. There is no one there to congratulation you for your happiness. The truest kind of happiness is the happiness you can experienece in your most ordinary moments. These are the easiest moments, but we seem to label them the least worthwhile. So many times we are laying our happiness on the behavior of others. If they would only do this, show up here, give me that, tell me this, I’d be happy. How can happiness be based on so many conditions? Aren’t you the only one responsible for your happiness? Happiness is already there, just let it out. This is why I love a good home yoga practice, and why usually I find so much happiness in it. The only person I am counting on in that practice is myself. The only person I could let down is myself, if I don’t do the practice. But most times I find that once far enough into the practice, whether its going good or bad doesn’t seem to determine my happiness. What I usually experience is my happiness comes out of being grateful that yoga is in my life, and that I’m well enough to practice. I’ve gained enough experience to realize a good yoga practice isn’t made by its outward appearance but more so by what you get for your effort. Happiness doesn’t come wrapped in shiny paper with a bow around it. If you’re looking for happiness to look like a party and that you are the guest of honor, don’t hold your breath. Instead breathe (prana) into the life you have that’s just wrapped up in the ordinary things, and stop chasing your own happiness tail. Happiness is all around you, and available to you when you stop demanding it look, act, and behave a certain way. And if your not getting the happiness you feel you deserve maybe you should start telling yourself a new story or take another look at the story you already have. But remember, your happiness tail isn’t going to be attached to someone else’s bottom. Thomas Edison’s once said “Opportunity is missed by most people because it is dressed in overalls and looks like work.“, you might say this of happiness as well. Happiness is independent, and we all already have it inside us. The hamster wheel of my greed. Posted on 01/21/2013 by Stand and face the sun. I just passed my year mark of writing my blog. Geez it went fast. I am pleased that I stuck with it, even though at times I was doubting myself and finding it hard to create space to do it. But since it’s another new year, essentially another circle around the sun, I’m left with that reflective feeling. Which naturally pulls me to the place of gratitude. I am so thankful that people read my blog. But I need to keep the reality in sight that I’m not doing it expecting thanks. I’m doing it to hold my feet to the fire and to challenge myself by doing something that makes me uncomfortable. There is nothing comfortable about writing for me. You all know why and that is because we all have a harsh critic that lives inside our head. No matter the activity, there is always a voice available to bring down the gavel of whether something is good or bad. Even without that voice, there is always the available sound of silence, where you can hear the crickets rubbing their legs together while you wait for the social media world to respond, waiting to hear that someone likes your blog, so that you are validated as a blogger. But if you look around you’ll soon pick up on the vibe that now a days there is nothing original about being a blogger. Everyone can do it and many do. So, I remind myself that even though it’s nice to receive the support, it’s not the reason why I blog. I blog to sharethe knowledge I have gained on my yoga mat. And yes, I do blog so that I can put things on paper. These are my ideas that I find worthy of exploration. I definitely do this to see an idea to its end. However, I have found that often times my ideas have no end, and a very poor beginning. I often find putting an idea on paper to be intimidating. The whole sharing thing too, really rattles me. The process of sharing can really bring up stuff. I found myself a few years back getting ready to host a teacher training on yoga. As I was getting information together, I found myself confronted with my greediness (Aparigraha). That I didn’t want to share what I thought to be some of my greatest insights, cues and ideas behind yoga. I wanted to hang onto these secrets that I felt I had come to on my own merit of hard work. I found it hard to release these things that I felt were my personal gain from yoga, instead of seeing them as my personal contribution to yoga. I had this fear that if I gave up my secrets that I’d be helping someone else get ahead of me or they’d come about it easier than I did. That doesn’t really make me sound all that nice now does it? No, but it does make me sound human. That voice in my head saying “I must get ahead, I must get ahead, I must get ahead!” – little does that voice know that because of greediness, it’s a lot like running in place on a hamster wheel. You can not get ahead until you stop grasping things so tightly. So, I had a moment where I guess I got tired of holding onto all my secrets, or maybe I came up with a new angle of how giving away all my secrets would get me ahead, or maybe, I hope, I came to a place where I ditched the “I” and came on board with the “we”. That in helping other people grow, you grow as well. 5 simple words that changed me. What you get out of “we” and not “I” is growth. I started sharing some of my insights with the new eager yoga students and I found that in my sharing, I grew. That the actual holding on was holding me back. It was in the letting go that I changed. Recently a saw a funny magnet that read “Let go or be dragged.” When I read that it was like my Wiley Coyote moment of getting hit in the head with a anvil. It spoke of my behavior louder then anything else has. It was 5 tiny words. 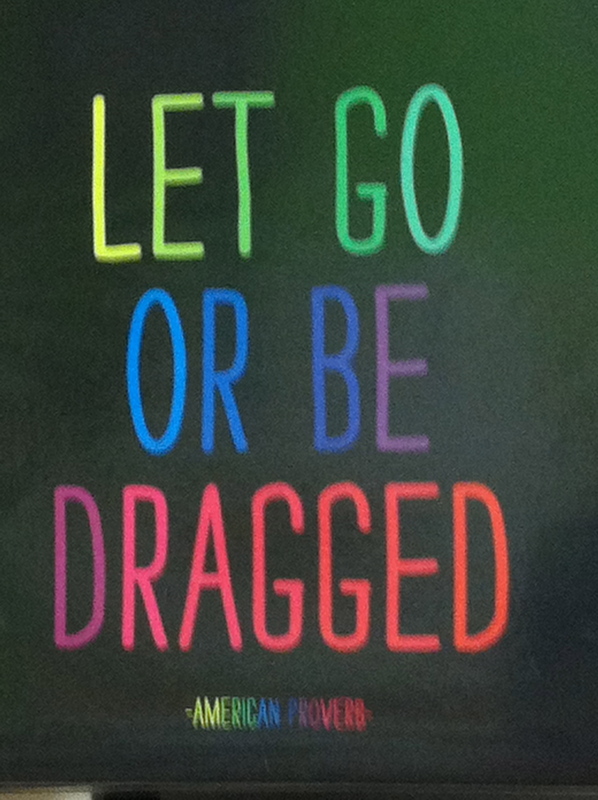 “Let go or be dragged.” See, I’m a grasper. If I were going to admit to you my dependency… it would be GRASPING! I grasp, and I grasp to things tightly. I do this out of comfort. The comfort you feel by staying the same. The definition of same/saym/ •adj. 1.unchanging 2. unaltered 3. constant 4. monotonous. Even though monotony might give you comfort, you might also come to realize it makes you boring, predictable and dull. One of the reasons I am still so addicted to yoga is because it has changed me. My body and mind are different. Everytime I’m on the mat something new springs up. Yoga, when practiced is a lot like a river. When you stand in a river the water touching you is always different, because there is movement. It’s never the same water twice that passes over your feet. That’s how yoga feels to me. Even if while practicing I’m resisting change, it is inevitable because of the movement the practice is facilitating. When I started to see this I became more willing to let go. To let go of ideas, to let go of the tricks I figured out to do a pose more gracefully, to let go of things I felt only my ears had heard from my teachers. How did I let go of my grasping? I shared as much as I could with those (9) first time yoga teacher wannabe’s. Now I do it every time I teach, by not holding anything back. By being an open vessel of information. Is all my information right, well for me it is, because it has worked. That doesn’t make it absolute, it just makes it one path, or maybe a better way to say it is my ideas are just one river you could take to flow into the great ocean of information on yoga. Sharing will change you. It’s uncomfortable and makes you feel vulnerable, but it has movement and that movement will take you places. Places you never thought you would go. So I’ve done it, with blogging I have found another way to grow, to change. I’d like to “thank” WordPress for making it easy for me to grow. I’d like to thank all the people that jumped into my river to feel the rush of movement in their own lives by opening up their mind to my ideas. Each and every person that has read, liked and or commented on my blog has taken that little step in sharing and I’d like to say “thank you”. It means the world to me that you share your thoughts. I hear them, value them and I use them to help me keep growing, to keep pushing through how uncomfortable I feel sometimes putting my words on paper. Thank you for helping me to grow, for helping me to let go so as to not be dragged. 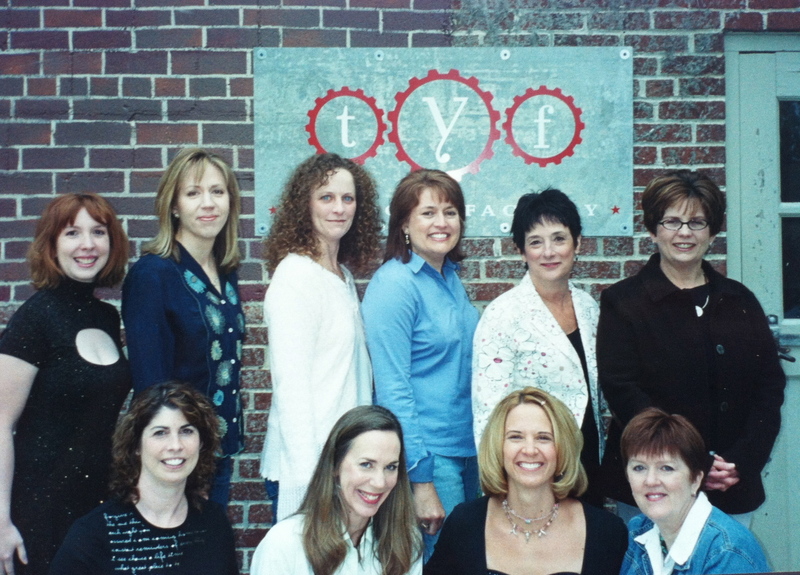 The first 9 ladies I shared my growth with. Julie, Rachel, Jodie, Stephanie, Beverly, Janet, Polly, Christina, Me, Gwen.